Southern Colorado HRC begins club training days the second weekend in February every year and continues through the end of the May. There will be training every weekend rain or shine with the exception of holidays. Club members will help teach you to train your retriever. It takes work on your part, both at training days and during the week. If you do not have a few minutes a day to work your dog, you may want to send your dog to a professional trainer. While there are several members that have been doing this for over thirty years, we are amateurs with our own dogs. No one wants to hunt with a dog that is running around and out of control. Considerable time is spent setting the foundation of steadiness. Sit, stay and come are the most important things you can teach your pup. We train to control our retrievers in very challenging situations. Retrievers are born to retrieve. Through drills and exercises we help you train your dog to be the best that they can be. We change cover, terrain, and items of suction to teach how to mark better and be more consistent. Blind retrieves require the dog and handler to work as team to navigate to a fall unseen by the dog. Using a whistle and hand signals to your control your dog to quickly get to the bird. We train drills to help you and your dog to work as a team running blinds. SCHRC trains at the Lake Pueblo State Park through a special use agreement. 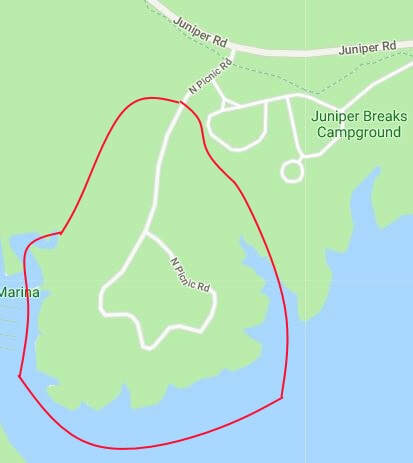 We are limited to the North Picnic Loop, or "Juniper Breaks", area. Dogs are allowed off lead while the dogs are training. Guns with poppers (blanks) as well as birds can be used in this area. You are welcome to train individually or in groups in this area. This is only available to club members with a current club sticker on their windshield. This area allows a variety of topography, cover, and challenging features. Water training is available when water levels are higher. Please remember we share this area with others. Be aware of where others are using the park and leave it better than you found it. It is important to understand that this group is dedicated to helping train HUNTING RETRIEVERS! From the beginning of training we use real guns and real birds as training tools. All participants are encouraged to use these tools. If you do not have experience with guns we will help you learn how to safely use guns for training.